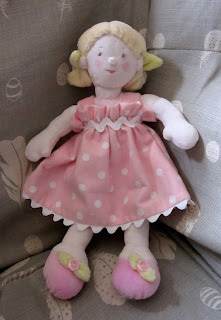 ollies everywhere in my head at the moment as I'm frantically trying to produce some styles that would be more commercial than the ones I have done before......this dolly would be for a much younger age group hence the velvet/velour style hair which would be more suitable than lots of wool, and much softer.The face needs a little more cheering up though as she looks a little non plussed sitting in my armchair! er..... you MADE this doll!!!!!??? I am with you, Meredith Jean! Go for it, Danielle!!!!! Michael Miller might be a great place for you, if you win, my friend. If not, I can talk to Kathy Miller, the owner, and have you send stuff direct!!! Think of yourself as a fabric designer RIGHT NOW! Don't say that you aren't one ever again! Deal? I'm headed back to Santa Fe this afternoon....talk soon? GREAT DOLL DESIGN DANIELLE! CAN YOU MAKE ME SOME VELOUR HAIR TOO WOULD BE A HUGE IMPROVEMENT ON MY UNRULY MOP! Beautiful, my 3 year old daughter would love it.